We’ve already seen the likes of the Vurhonga Savanna and the Medved-Taiga National Park arriving as DLC for theHunter: Call of the Wild, but now the Parque Fernando reserve is available to purchase on Xbox One. It’s time to head out to an environment inspired by a South American region and see what new species are lurking about in the wild! Parque Fernando is the fifth reserve brought in to enhance the theHunter: Call of the Wild experience so far and it’s simply buzzing with life. 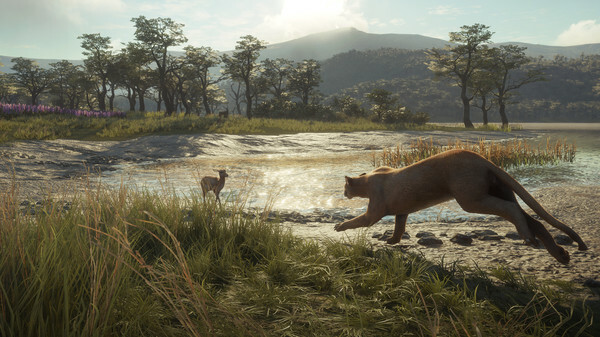 Players can expect to find a large range of wildlife here as it brings in new species such as the Puma, the Blackbuck, the Water Buffalo, and the Axis Deer. The inspirations for the reserve are taken from the South American region of Patagonia, featuring lupine meadows, tranquil lakes and a dead forest. There’s a whole load of land to roam too, given that it measures up at over 25 square miles in total. The choice is yours whether to simply explore everything the environment has to offer at your own pace or take on the new story. As part of the 16 new narrative missions and 39 side missions, you’re asked with proving your worth to the reserve’s owner, Carolina. This means traversing the swamps and venturing across the grasslands whilst opening outposts and building lodges, to ensure the previously unfinished Parque Fernando reaches its full potential. If you wish to add more longevity to the base game with theHunter: Call of the Wild – Parque Fernando DLC, all you need to do is purchase it from the Xbox Store for £5.59 on Xbox One. What’s great though is that players who don’t own the content themselves can still take part in a Parque Fernando multiplayer game just by joining someone who has paid for it. We always like to hear your thoughts on the latest games and DLC, so be sure to get in touch and share them with us. Hunt Pumas, Mule Deer, and more as you explore the lupine meadows, dead forests and other lush environments of the open world of Parque Fernando, stretching over 25 square mile (64 square kilometer). Featuring 16 new narrative missions and 39 side missions, players can play alone or with friends. Players who don’t own the DLC can still experience a multiplayer game set in Parque Fernando at no cost, by finding a player who owns it and simply joining their game.